thirty-five years later, when George the Third had reigned nearly thirty years, and when that awful storm was brewing in France which burst with such terrific violence only four years later. When the brevity of this lapse of time is borne in mind, we cannot but experience a feeling of astonishment at the extent of the difference which distinguishes the respective designs illustrated in the two works named. The latter firm, it is true, to a certain degree, followed the lead of their great forerunner in respect of borrowing from across the Channel (I have noted that Sheraton did the same); but, on the one hand, they seldom descended to mere slavish copying; while, on the other, they endowed their creations with a far greater measure of originality than did any of their contemporaries, not excepting even the rarely gifted Sheraton himself. 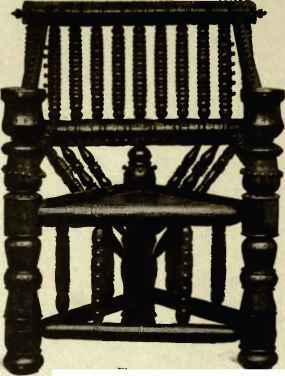 In their preface to "The Cabinet Maker and Upholsterer's Guide/" Messrs. Heppelwhite & Co. proffer the following "apology" for the publication of their ideas: "To unite elegance and utility, and blend the useful with the agreeable, has ever been considered a difficult, but an honourable, task. How far we have succeeded in the following work it becomes us not to say, but rather to leave it, with all due deference, to the determination of the public at large." The task attempted was, truly, in no respect an easy one to accomplish successfully, but they went bravely and conscientiously to work, and with rare spirit and no small spice of genius to aid them in their endeavours. In the end, the verdict of the "public at large" was an extremely favourable one, and has continually been verified and confirmed during the course of nearly a century-and-a-half; nor could it by any possibility have been otherwise.